damn. Too slow on the buzzer. My second guess would be an energetic academic sperm busily attempting to enter the hellish egg of scientific publishing. Nope, but you’re on the right track. It is something that I’ve discussed a zillion times here and in my papers, but I don’t think I’ve ever illustrated before. We have a winner! Yes, it is supposed to be the process of pneumatization: a bone, nourished by a blood vessel (the squiggly thing on the right), being discovered by a diverticulum that followed that blood vessel and then burrowed inside. I didn’t think about it at the time I took the picture, but everything in it is related. The diagram at upper right is a simple dorsal or ventral view of cervical ribs attaching to a vertebra, from a completely separate conversation. 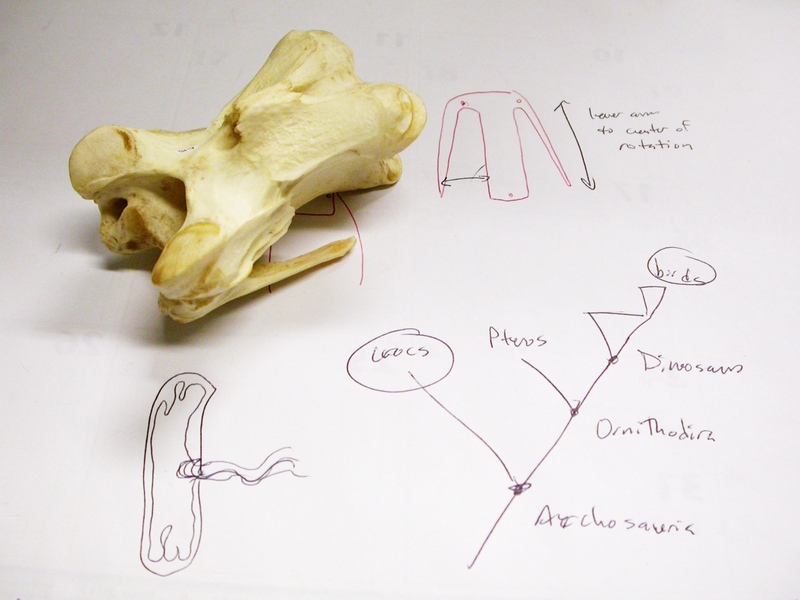 The ostrich vertebra has cervical ribs, is pneumatic, and represents an avian dinosaurian ornithodiran archosaur, so it embodies concepts from all three diagrams. Oh, and since we’re all up in Elsevier’s business these days, I award you 2 billion SV-POW!bucks. You may now pay off your shareholders, buy some legislators, and start charging $30 a pop for people to view this post. « Building Insights. Breaking Links.